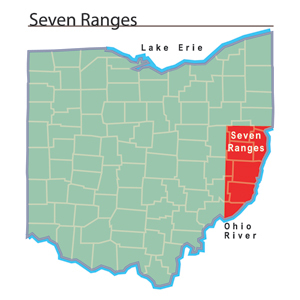 The Seven Ranges was the first area to be surveyed by the American government as part of the Northwest Territory. Thomas Hutchins, the geographer of the United States, carried out the Seven Ranges survey according to the guidelines provided in the Land Ordinance of 1785. Hutchins began his survey work where the eastern boundary of the Northwest Territory met the Ohio River, at modern-day East Liverpool, Ohio. This starting point was known as the "Point of Beginning." Each range was made up of a vertical row of townships. The surveyors plotted a total of eight lines, each six miles apart, in this first survey. The end result was seven north-to-south rows or "ranges" of townships open for settlement. Hutchins died before completing all of the survey work, but the government continued the process after his death. The American government hoped to use the profits from the land sales in the Seven Ranges to pay off debts from the American Revolution. However, land sales proceeded at a very slow pace. There were also problems with squatters who lived on the land illegally and American Indians who felt threatened by encroachment on their lands. The American government soon began to sell large tracts of land to investors and speculators and left them with the task of finding individual buyers. The government's first large land sale was to the Ohio Company of Associates, whose land claim was located southwest of the Seven Ranges. Phillips, P. Lee. The Rare Map of the Northwest, 1785, by John Fitch: A Bibliographical Account, with Facsimile Reproduction Including Some Account of Thomas Hutchins and William McMurray. Washington, DC: W.H. Lowdermilk & Co., 1916.